SYDNEY - Asian shares consolidated recent gains and currencies kept to tight ranges on Wednesday as investors waited to see what policies might emerge from China’s Communist Party conference. The twice-a-decade congress is expected to cement the power of President Xi Jinping, who kicked off the week-long event with a wide-ranging speech in which he said the market would be allowed to play a decisive role in allocating resources. Investors are keen for any direction on economic and financial market reform over the next five years, though history suggests these events can be light on detail. On Tuesday, the United States again declined to name China as a currency manipulator although it remained critical of the Chinese government’s economic policies ahead of a planned visit to Beijing by President Donald Trump. The blue-chip CSI300 index was up 0.3 percent, while Shanghai stocks added 0.1 percent. Recent economic data from the Asian giant has been generally upbeat, fuelling a tide of optimism about global growth that has benefited shares across the region. MSCI’s broadest index of Asia-Pacific shares outside Japan .MIAPJ0000PUS edged up 0.1 percent, near their highest since late 2007, while Australia rose 0.2 percent. 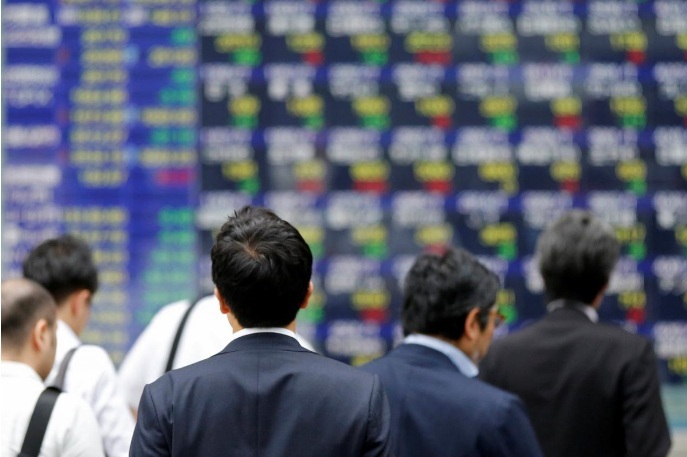 Japan's Nikkei added 0.1 percent and was trying to string together a 12th straight session of gains. An opinion poll by Kyodo showed Japanese Prime Minister Shinzo Abe’s coalition was on track for a roughly two-thirds majority in Sunday’s general election there. The bullish mood on equities was evident in the latest fund manager survey from BofA Merrill Lynch. “For the first time in six years, Goldilocks trumps secular stagnation, with a record high 48 percent of investors surveyed expecting above-trend economic growth and below-trend inflation,” the survey found. Investors were bearish on bonds with 82 percent of those surveyed expecting yields to rise in the next 12 months and a record 85 percent believing bonds were overvalued. Interest rates futures <0#FF:> imply around a 90 percent probability of a Fed hike in December FEDWATCH. The shift upward in yields lifted the dollar to one-week top against a basket of currencies .DXY, and kept it steady on the yen at 112.17. The euro was holding at $1.1772, still some way above the recent low and major chart support at $1.1667. Dealers were wary ahead of speeches by several policymakers from the European Central Bank due later on Wednesday, which includes President Mario Draghi. The biggest mover had been Mexico's peso which boasted its biggest rise in over four months after trade ministers from the United States, Canada and Mexico extended the deadline on a contentious round of talks. On Wall Street, the Dow ended up a slim 0.18 percent having briefly broken above the 23,000-point mark for the first time on Tuesday, while the S&P 500 gained 0.07 percent and the Nasdaq dipped 0.01 percent. Shares in IBM jumped nearly 5 percent after hours as a shift to newer businesses such as cloud and security services helped it beat Wall Street’s quarterly revenue estimates. In commodity markets, talk of higher U.S. interest rates kept gold pinned at XAU= $1,288.10 an ounce. Oil prices got a boost from a drop in U.S. crude inventories and concerns that tensions in the Middle East could disrupt supplies. Brent crude futures LCOc1 firmed 43 cents to $58.30 per barrel, while U.S. crude CLc1 gained 26 cents to $52.14. Asian shares consolidated recent gains and currencies kept to tight ranges on Wednesday as investors waited to see what policies might emerge from China’s Communist Party conference. The twice-a-decade congress is expected to cement the power of President Xi Jinping, who kicked off the week-long event with a wide-ranging speech in which he said the market would be allowed to play a decisive role in allocating resources.